FOR ANY DIE-HARD Pink Floyd fan (arm held aloft here), the sight of a reinterpretation – a what?! – of their seminal 1973 colossus Dark Side Of The Moon might be met with an equal measure of trepidation and intrigue. After all, those of us whose teenage years were coloured by the thrill of ‘prog’ are likely to have this particular Gilmour, Waters, Wright & Mason album in their DNA, even to the very detail of guitar and vocal solos. It’s been done before, of course – Ari Hoenig, The Flaming Lips, dubstep, reggae, string quartet, a cappella – and the initial signs here are particularly good: a concept fostered by Siggi Loch, on his go-ahead ACT label, with the venerable approval of Nick Mason and featuring dynamic guitarist Nguyên Lê (who has recorded exclusively with ACT for some time now, including collaborations with Pete Erskine and Michael Bonita). The anticipation, excitement and validity of this seemingly-audacious venture is further raised by the personnel involved – the renowned NDR Bigband realising the orchestrations of respected British composer, arranger and band leader Michael Gibbs, joined by Youn Sun Nah (vocals), Gary Husband (drums) and Jürgen Attig (fretless bass). 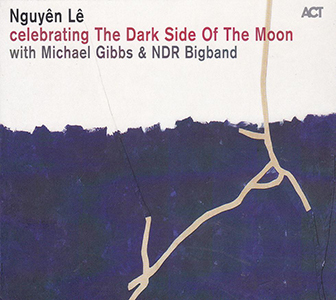 For this jazz/rock ‘celebration’, Nguyên Lê arranges all nine (or ten) numbers from the original, as well as weaving-in five self- and co-written Floyd-inspired miniatures. The transitions are remarkably organic, and Gibbs’ big band orchestrations frequently breathtaking, but how well do these familiar tracks translate into this new guise? Heralded by the electronic cross-conversations of Speak To Me and Lê’s similarly impressionistic Inspire, the big vocal of Breathe is presented soulfully by Youn Sun Nah against a wall of big band splendour. Following on, the panicky momentum of On The Run is expertly effected by Jürgen Attig’s bass and Christof Lauer’s swirling soprano until, waking to radio-controlled timepieces, Time is cleverly reimagined, announced by Gary Husband’s thunderous toms and powerful big band blasts. There’s a tendency for Gilmour’s originally-relaxed, oscillating semitone lines to somehow become mechanical, even monotonous, in this arrangement, and Youn Sun Nah’s later lyric entry appears an unnecessary add-on. But, otherwise, it rocks to Lê’s distinctively complex guitar improvisations and electronics. Magic Spells and the charming marching band-like Hear This Whispering (both from the pen of the guitarist) precede a dazzling adaptation of The Great Gig In The Sky, Clare Torry’s classic, impassioned (and presumably improvised) ’70s vocal imitated incredibly accurately by the blistering big band. That transcription is so satisfying, and all too brief, though segued by Jürgen Attig’s luxuriant, Jacoesque fretless bass and Nguyên Lê’s impossibly rapid guitar runs in Gotta Go Sometime. The timeless 7/4 ‘prog’ wonder of Roger Waters’ Money translates magnificently here into super-funky, clav-driven brilliance, Gary Husband’s heavy-yet-bejewelled drums and percussion ringing through it as a golden thread; and the incisive rhythmic urgency in the band, plus Lê’s liquescent, amplified lead, is mind-boggling – a triumph, in fact. Us And Them is ingeniously reshaped – a delicate oriental motif which extends into big band grandeur, Fiete Felsch offering a beautifully effortless alto solo; and, again, Lê prompts sympathetic improvisation – the trumpet of Claus Stötter – in his Purple Or Blue. Full-on groover Any Colour You Like leads to Youn Sun Nah’s psycho-interpreted Brain Damage, maintaining its bizarre combination of disturbance and affirmation, again rippling to Husband’s extraordinary drum prowess; and closing, there’s the heightened big band illumination of Waters’ anthemic Eclipse. Having had this running through my veins for the past few weeks, its overriding success has really caught my attention – and, along with the ’41-year-old’ on the CD shelf, it has pleasingly become something of a repeat player! Released on 3 November 2014, further details and audio samples can be found at ACT Music.